There has been a lot of buzz around Little Darlings lately, and not without cause. This soon-to-be-published debut of Melanie Golding is without doubt something special! 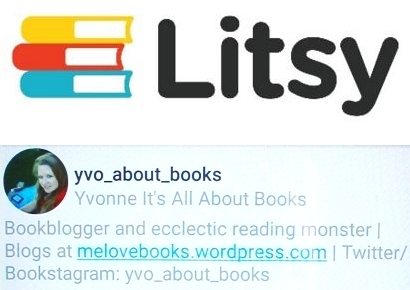 Little Darlings is not your ordinary psychological thriller and instead offers a fascinating mix with folklore and fairy tale elements. A hint of the surreal is mixed with suspense and a mental health angle in such a fluid way that really makes the folklore stories come alive… It’s without doubt an intriguing mix of genres and different elements that will keep you wondering until the very end. Little Darlings is basically three different storylines in one: one one side we have detective Harper, her history and the investigation, on another side we have Lauren Tranter, her newborn twins and her home situations and as a third element we have the supernatural mixed with a mental health angle. This might sound like a bit much, but the plot is constructed and developed in such a a way that makes everything connect seamlessly. 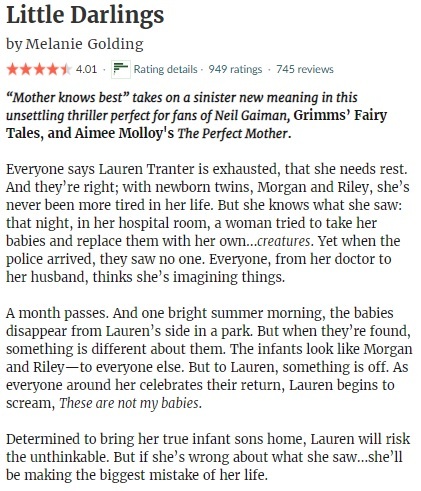 My favorite part of Little Darlings are the folklore elements, which give the story an unique touch as well as adding a healthy amount of suspense to the story. Is it all real? Or is it part of the postpartum depression Lauren seems to be suffering from? These questions will keep going round and round in your head and will keep you wondering ever after you reached the final page. Oh yes, Little Darlings has an ambiguous ending you can interpret both ways… And this time around, this technique really worked for me and added an extra mysterious vibe to the overall story. As for the characters… I’m not sure I actually liked most of them (although I did like Harper and her stubborn insistence to investigate the case), but they do fit the story in general. I confess I had a strong dislike of Patrick though, and the final reveals involving his character and actions were not really satisfying. But that was only a minor blip compared to my general feelings for this wonderful mix of folklore and reality. Time for another round of Yvo’s Shorties! 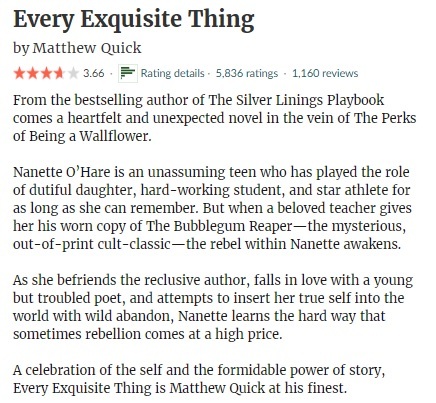 This time around a title I ended up having mixed thoughts about (Release by Patrick Ness) and another I picked up based on recommendations and ended up really enjoying (How To Walk Away by Katherine Center). 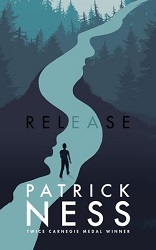 I had been meaning to pick up another Patrick Ness title for a while now, and thought the Magical Readathon was the perfect excuse to do so. I’ve been seeing mixed things about Release ever since it was… errr… released, so I decided to keep expectations low. I’m glad I did, because I ended up having mixed thoughts about this story as well. In fact, something similar happened with The Rest Of Us Just Live Here (the chapter introductions vs. the rest of the chapters) so I’m guessing this particular writing style and me just don’t really get along. What do I mean? Well, while I mostly enjoyed Adam’s chapters, I wasn’t so sure about the other more fantastical one (Katie). Both were so extremely different in tone and even genre that they mostly just clashed for me (like what happened in The Rest Of Us Just Live Here). I know magical realism can go both ways for me and this time around it definitely wasn’t a positive reaction… I had a hard time making sense of Katie’s POV and it mostly just distracted me considerably from what was happening to Adam. The way both POVs finally ‘met’ wasn’t really satisfactory for me either, but that might just be me reacting to the magical realism. I did enjoy the writing in Adam’s POV and I really loved that while the story is basically taking place in just one day, there is a lot going on and you won’t find yourself bored. Adam sure is having a pretty bad day! Religion is involved since it plays such a vital role in Adam’s family (and part of his misery), but nothing too preachy so I didn’t mind. The story wasn’t too heavy on the romance as a whole (something I could really appreciate), and the lgbt elements were well developed. If Release would have been just Adam’s POV and nothing more, I would probably have ended up rating it higher… But Katie’s more unique magical realism chapters kind of put a damper on things for me. Depending on how you react to those chapters you will either absolutely love it or end up having mixed thoughts like me. There has been so much hype around How To Walk Away ever since it came out last year that I’ve been a bit afraid to pick it up myself. But after seeing so many raving reviews, I was also curious to find out what I would make of this story myself. 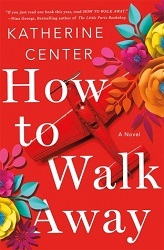 I think I’ve become an instant fan of Katherine Center‘s writing, and she is a new addition to my short list of contemporary romance writers that are able to make me enjoy the genre. It took a few chapters to warm me up completely to the characters and the situation, but once I did I was hooked. The writing is excellent and one of the things that really stood out for me. Following the main character as she has to learn to live with the consequences of the accident was both heartbreaking and intriguing, as her struggles and fears are realistically and well described. Chip made me want to hit something, but I guess that fits the purpose of his character… I liked seeing Margaret’s character develop and grow over time though. How To Walk Away isn’t just about recovering after an accident, having to learn to live with a disability and Margaret seeing her life changed forever though. It is also about family and the estranged relationship with her sister. All characters in general are well developed, feel realistic and add there little something to the plot. I could really appreciate this was more of a slowburner romance and instead there is a lot more focus on Margaret’s situation and personal development. The chapters set in Belgium brought back memories of Bruges and made me crave chocolate! 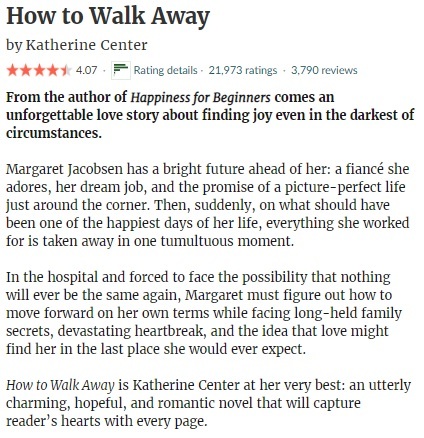 The ending of How To Walk Away was without doubt satisfying and I would recommend this story to anyone who enjoys the genre. Time for another round of Yvo’s Shorties! 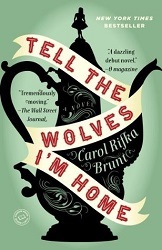 This time two YA reads I’ve been meaning to pick up for a while… Neither managed to blow me away, but I did enjoy Tell The Wolves I’m Home by Carol Rifka Brunt better than Every Exquisite Thing by Matthew Quick. 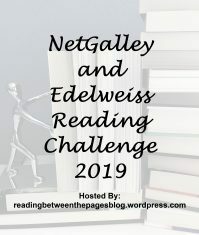 I actually picked up this title on a whim when I was browsing for a contemporary read and I realized it would fit my Author ABC challenge perfectly. I’ve read his work in the past and I especially enjoyed meeting Leonard Peacock, so I was hoping to have a similar experience with Every Exquisite Thing. Unfortunately it just wasn’t ment to be… I love my quirky, flawed and unique characters, and I can appreciate an original writing style. There was just something about both characters and writing that failed to convince me in this story though. I know I’m in the minority here since most people seem to love this story, but it is what it is I guess. 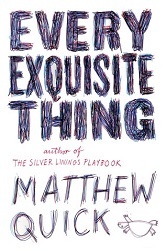 While I can say this was a superfast read, the tone and writing style of Every Exquisite Thing really started to get on my nerves and made the reading experience less enjoyable than expected. I also had problems with the main characters… While I like that they are flawed and unique and especially Nanette evolves over time as the story progresses, there was also something about them that really annoyed me and I wasn’t able to connect to them in general. I did love the fact that this story is build around a book called The Bubblegum Reaper, where we see both the influence of the writing on its reader and learn more about the author himself. I also loved the poetry references and the incorporation of Alex’ poetry into the story. Then again, I always love bookish references! This was definitely one of the strongest aspects of the story and you will see influences of The Bubblegum Reaper throughout Every Exquisite Thing. 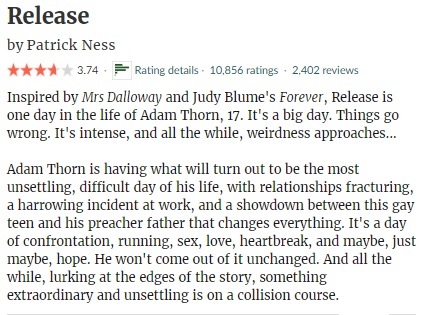 I wasn’t sure about the ending and the characters and writing style weren’t for me, but there is no doubt that this is quite an original coming of age story. 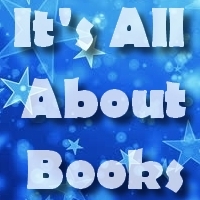 If you are able to connect to writing and characters, you will have a great time reading it. I’ve been meaning to pick up Tell The Wolves I’m Home for ages now, but there was always something that made me pospone it just a little while longer… I’m glad my TBR jar pick thought it was about time I did something about that. I somehow had it in my head that this was a magical realism read, but it turns out I totally misremembered that. Instead, Tell The Wolves I’m Home is a (recent) historical fiction slash contemporary story with a focus on family, AIDS and death. Tough themes that are very tricky to get right and sometimes not that easy to talk about, but the 1987 setting made for a very interesting backdrop for this story. We learn more about prejudices, just how little information about AIDS was available back then and the consequences… While also focusing on family, relationships and dealing with the death of someone close to you. I can’t put my finger on the why, but while I did find the Tell The Wolves I’m Home a very interesting read, there was also something about it that didn’t work for me. Part of this might have to do with the main characters; especially Greta is very frustrating and felt quite cliche. 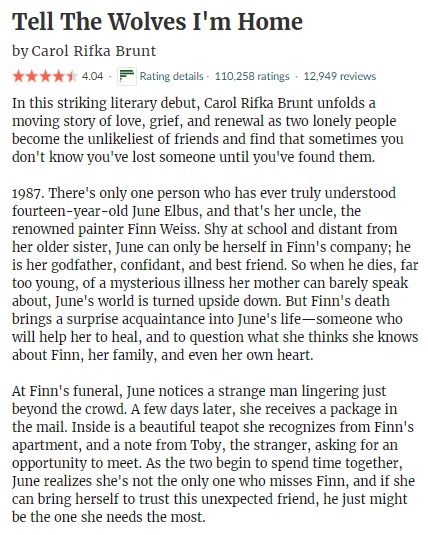 I liked Finn and Toby though, and June was interesting enough as well. I liked the art element in this story and the meaning of the painting of the two sisters. I also liked how we saw the wolves being incorporated into the plot. I could have done without the teenage/high school drama, jealousy and there were other elements that irked me as well. But overall I’m still glad I finally read it. Time for another round of Yvo’s Shorties! This time around a story that failed to convince me completely and another that completely won over my heart. 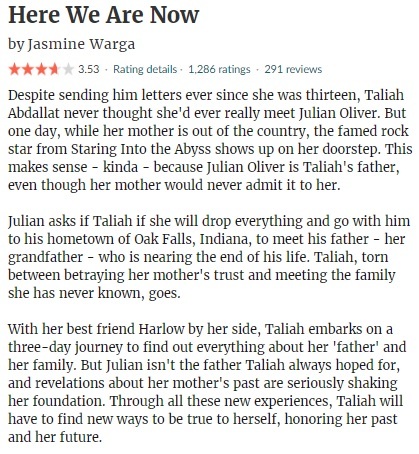 Here We Are Now by Jasmine Warga wasn’t as good as I hoped, especially after loving her debut… The Travelling Cat Chronicles by Hiro Arikawa was a fantastic read though. I have been looking forward to read more of Jasmine Warga‘s work ever since I loved her debut back in 2015… It took me longer than expected to get to Here We Are Now, but I guess better late than never right? It might have been that I had set my expectations too high, but unfortunately I can’t say I was all that impressed by this story as a whole. It’s not a bad read and fans of character driven YA contemporaries will probably have a great time with this one. It’s not the writing either, which felt natural and I just loved the many musical references. But there was just something about the plot and characters that didn’t manage to convince me. The plot is rather simple and nothing much is going on; it shows that this story is mostly focused on the main characters. This means we see a lot of the sixteen-year-old Taliah as well as her parents Julian and Lena and their past. On its own nothing negative, but there was just something about the characters that started to irritate me. Taliah came over as rather childish and whines a lot… Julian can be a bit intense and Lena is rather annoying even though she also has an interesting aspect with her being an immigrant in the US and her having to adapt to a new country (something I can relate to). I didn’t agree with some of the actions and reactions of the characters and I’m not sure parts felt all that natural. Like I said before, the musical elements were a nice touch though and I liked how the story was partly set in the past as Julian tells Taliah how he first met her mother and what happened. Sadly I failed to connect with this story, but I’m sure the right person will absolutely adore Here We Are Now. As some of you might already know, I am what you call a true catlover or crazy catlady. I have loved these feline creatures ever since I was tiny, and even a bout of childhood allergy couldn’t cure me of that love… Thankfully I grew over my allergy, and I have been lucky enough to share my life with a bunch of different feline friends during the last eighteen years or so. The Travelling Cat Chronicles is the perfect book for anyone who enjoys being around cats. It’s so easy to relate to this wonderful story! The first thing that stands out and makes this book special for me is the fact that the story is narrated by a cat. 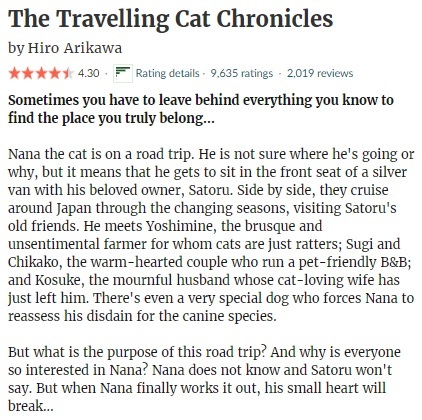 Yes, you read that right, the main character of this story is a very special cat named Nana who tells all about his adventures together with his companion and owner Satoru. Very original and it definitely made the story that much more powerful. We get to know both Nana and Saturo better through their adventures as they visit various childhood friends of Saturo. It’s not only a journey within Japan, but also a journey to the past as we learn more about the different characters both then and now. I loved how not only Nana, but other animals get to play a role in the story as well. The descriptions are wonderful as is the writing style in general… The characters will win over your heart in record time and will stay with you for a long time. Warning: make sure you have your tissues ready! Because the end will most definitely make you cry (I know I did, and I almost never cry). The Travelling Cat Chronicles is a fantastic read I could see myself reading over and over again. Time for another round of Yvo’s Shorties! This time a modern classic I somehow never read when I was younger and a new release I have been really excited about. Both turned out to be really good reads! 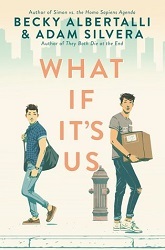 A Wrinkle In Time by Madeleine D’Engle and What If It’s Us by Becky Albertalli & Adam Silvera. Somehow, I’ve managed to grow up without ever reading this modern classic. 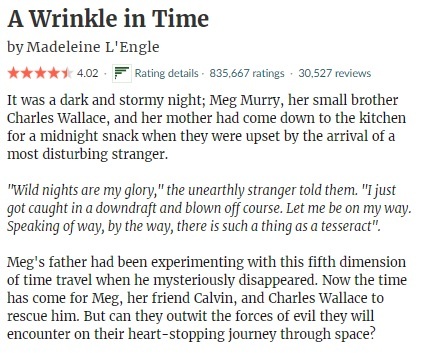 Don’t ask me how, don’t ask me why, but I sure wish I would have been able to read it twenty years ago… Still, A Wrinkle In Time made a more than solid impression on me as an adult. I definitely understand the love for this story now! 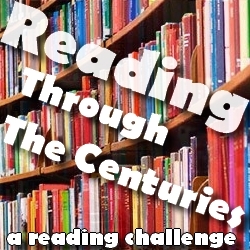 The writing style draws you right in and is very engaging and timeless. Even though the story was first published over 50 years ago, it will still be easy for children and adults alike to connect to this story. The plot itself is simple, but the setting in space and the time warps give the story a little something extra. The main characters are easy to like and all have their own personality. I also really liked how Mrs. Whatsit and her friends were represented not only with descriptions but also in the way they talked. 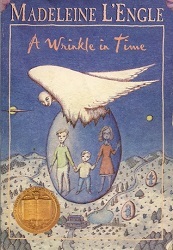 The ending was a bit too abrupt, easy and ‘clean’ for me, but overall I had a great time discovering A Wrinkle In Time. I’m not sure if I will continue the series any time soon, but I’ll definitely keep it in mind for the future. 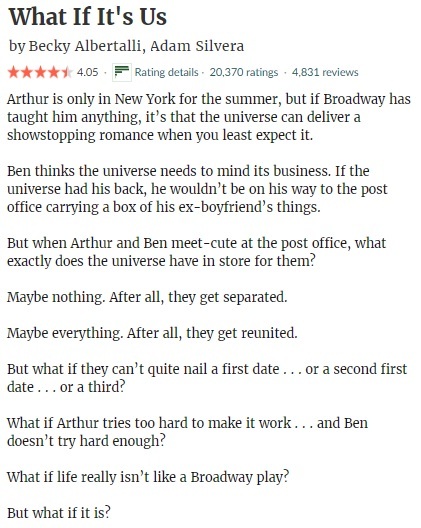 I’m a fan of both Becky Albertalli and Adam Silvera’s books, so I have been eagerly awaiting this collaboration ever since I first heard about it. I already had that feeling I was probably going to enjoy What If It’s Us, and it turns out my instincts were absolutely right. This was such an adorable read! The writing, the main characters, the geeky elements (go The Sims and Harry Potter references among others! )… It was just all so cute and fluffy and I had a wonderful time reading it. The story is told in alternate chapters going between Ben and Arthur. Each has his own personality shining through in everything and also has his own set of companion characters that will slowly merge together as one big group. I really loved the idea of the missed connection, the search of the so-called needle in the hackstack and what happens afterwards. The characters are all well developed, feel realistic and I love that they not only represent the lgbt community but also minority groups in such a natural way. The plot itself does have its moments where credibility is in doubt and there were also cliches as well as a love triangle involved, but overall this minor flaws fade away compared to the rest of the story. My heart melted for these characters, and as a Harry Potter and The Sims fan I’m stoked to see references to both incorporated into the story. There are other fandoms included as well and I just LOVE that Ben writes his own story. There is a lot to love in this cute, adorkable and fluffy read and fans of the genre will adore What If It’s Us. Without doubt a winner!